Harvey Mack Freeze’s New Book “Sir Derrick The Third From The Kingdom Of Dir” is a Rhythmic Children’s Book that Teaches the Importance of Friendship and Courage. Recent release “Sir Derrick The Third From The Kingdom Of Dir” from Page Publishing author Harvey Mack Freeze is a delightful and whimsical tale of a mouse that saves goes on an adventure to save his town. 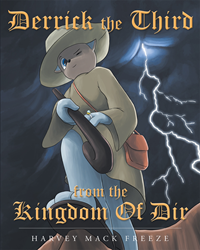 Harvey Mack Freeze, a devoted writer and author, has completed his new book “Sir Derrick The Third From The Kingdom Of Dir”: an exciting and imaginative adventure of a prince mouse that is trying to save his kingdom. Along the way he makes new friends and may save more than just his kingdom! Harvey Freeze is from the small town of Thibodaux, Louisiana. His life has been spent traveling in pursuit of his dream which has spanned over 20 years. Those decades have been filled with adventures that he has put into his character Derrick the Third. Harvey has been penning works for over 20 years. His great insight and intellectual mind have brought forth humble wisdom through the school of hard knocks. This book was written through pain yet brought about perseverance. As Sir Derrick the Third would say, "When life throws you lemons, you must make lemonade." This short story has been a labor of love. Published by New York City-based Page Publishing, Harvey Mack Freeze’s charming tale teaches the importance of friendship and looking in the most unlikely places to find happiness. “Sir Derrick the Third from the Kingdom of Dir” is the adventures of a wise, humble and last but not least courageously fearless mouse. Affectionately known as Sir Derrick the Third. Hey, who stole my cheese? Readers who wish to experience this creative work can purchase“Sir Derrick The Third From The Kingdom Of Dir” at bookstores everywhere, or online at the Apple iTunes store, Amazon, Google Play or Barnes and Noble.